Billy Phelan's Greatest Game introduces the Phelan family, whose ancestors and progeny appear in five subsequent novels and a play. Billy is a small-time Depression-era gambler, pool hustler, and bookie who, through association, becomes mixed up in the kidnapping of an Albany politician’s son. "This is not a book you read so much as slip into … Let Billy and Martin introduce you to their friends and enemies. 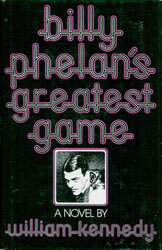 . ."
Billy Phelan's Greatest Game was published in Finland, France, Germany, Spain and Sweden.